Efficient, maintenance-free fan and motor assembly add to system gas burning efficiency. During construction, Applied Air uses laser technology for bearing alignment. All Applied Air indirect fired units go through a 140 point checklist prior to shipping. Four pass heat exchanger provides high efficiency, without use of turbulators, and maximum heat exchanger life. Provided with fuses and power transformer for single point electrical connection. Power type gas burner for maximum efficiency with optional controls to comply with FM & IRI. Using a powered burner to spread the flame deep down the steel chamber. Pulling the flame heated air evenly through all of the steel tubes by using an "induced" draft fan. Exposing the supply air to as much tubing as possible by using multiple "passes". Make-up air for applications where Direct Fired units are not allowed. Applied Air manufactures Indirect Fired equipment with heat output from 250,000 BTUH to 6,000,000 BTUH, and air delivery from 3,500 CFM to 94,000 CFM. The large surface area of the four-pass stainless steel heat exchanger provides high efficiency, without the use of turbolators, and maximum heat exchanger life. The 140 point final test procedure for every Applied Air indirect fired unit means fewer start-up problems. For maximum flexibility, units can be mounted indoors or outdoors, horizontally or vertically. Applied Air Indirect Fired units are 80% efficient and operate above condensing temperature. 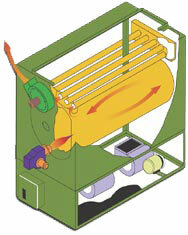 The power venter ensures that all products of combustion are properly vented, even in a negative building. Our flexible, "modular" IF Indirect Fired heating systems add warm, fresh and clean air to your work environment at the highest practical efficiency of 80%. IF units are available for indoors (IF), outdoors (IFW), or roof curb mounting (IFR). You can even add DX or chilled water cooling coils for a total comfort solution. The IF line replaces indoor air that can become chemical laden in a painting or processing operations, but without adding dust. Large volumes of exhaust air from kitchen hoods or industrial processes take away lots of heat from the space. 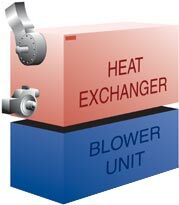 IF uits replace the heat efficiently. With airflows from 2,500 to 94,000 CFM and heat outputs from 350,000 to 6,000,000 BTUH, you can heat any size building. The IF product line operates at efficiencies of 80% in order to avoid the highly corrosive effects of condensation inside the heat exchanger tubes. Efficiencies over 80% can cause serious problems for normal heat exchanger materials.